Protect your shoes and work boots from chemical spills with our covers. Shoe covers keep chemicals off shoes but can also be used when painting, or to avoid tracking mud and dirt from boots into homes. Boot covers offer skid protection for safety and are made to be reused. 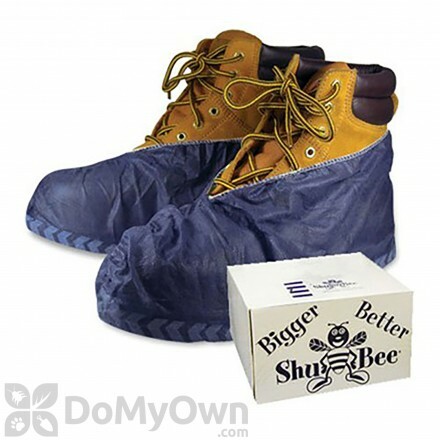 Original ShuBee Shoe Covers - Dark Blue are great for preventing dirt, mud, and other debris from entering homes! Shoe and boot covers can play an important part in DIY pest control or other work applications, especially with personal protective equipment, or PPE. PPE guidelines are listed as necessary on the labels of any pest control product. What is listed is not a suggestion, but a requirement of the minimum protection that must be worn. If it isn’t required, it’s still a great idea, since shoes are difficult to clean after a pest control application. Disposable booties or shoe covers are a very convenient and inexpensive way to not only protect your feet or work boots from dangerous materials, but also helps keep businesses, client’s homes, and your own home clean from dirt and mud. Disposable shoe covers are also available in non-slip, non-skid protection to keep you from falling indoors or outdoors on a jobsite. Shoe covers might seem like flimsy, unnecessary items that resemble surgical booties in an operating room, but these simple covers can make your dirtiest jobs just a bit cleaner. It’s simple to quickly transform your work boots into indoor shoes with a slip-on, disposable, protective shoe cover. ShuBee boot covers are perfect for running inside to grab a drink or meeting with clients while on the job. Since they’re disposable, affordable and come in boxes of 100, they are ideal for keeping in work trucks, on job sites, or in the garage. They not only keep floors clean and sanitary, but also protect your boots and keep them clean and in good shape for longer. Original durable non-slip shoe covers appear to be flimsy paper, but they’re actually strong enough to keep whatever is on your boots inside the liner. They’ll resist ripping or tearing, and the nonslip surface keeps you skid free indoors.